Development of Port Adelaide and the trams that served it. Adelaide’s first settlers arrived in 1836 at ‘Port Misery’, which was replaced by nearby Port Adelaide in 1840. The Port developed as a thriving village. Its privately owned wharves and cargo sheds served the ketches which sailed all around the South Australian coastline, and the interstate and overseas cargo and mail steamers. Fine commercial buildings were erected. A steam tram service to Albert Park commenced in 1879 but was replaced by horse-drawn trams in 1882. 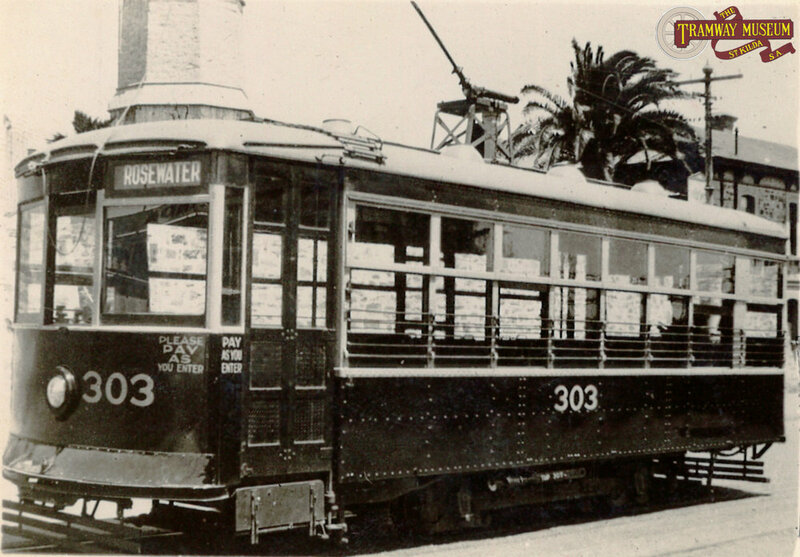 Electric trams ran between Port Adelaide, Largs, Semaphore, Albert Park and Rosewater from 1917 to 1935. Tram services in Port Adelaide commenced from the intersection of St Vincent Street and Commercial Road with the intersection known by the Tramways as 'Black Diamond' corner. Both the horse and later electric tramways were completely isolated from the rest of the main system with Albert Park trams in latter years having to connect with bus services from the City. Despite the early closure date of the Port Adelaide system, the Tramway Museum, St Kilda has managed to preserve three trams (42, 186 and 303) that used to operate there. Taken in the early 1920s, A2 type tram 42 (converted from a B type 'Toast Rack' tram) is seen heading along St Vincent Street in the heart of Port Adelaide before turning in to Commercial Road on a service running to Albert Park. Seen from the balcony of the Largs Pier Hotel, a tram has just left the Largs terminus next to the hotel and is running along Jetty Road on its way back to Port Adelaide. Photo: 1920s postcard. The electric tramway to Largs from Port Adelaide had been completed in time for the opening of the entire electric system in April 1917 but the commencement of services was delayed for six weeks due the tramway crossing over the Semaphore railway line at the intersection of Semaphore Road and Ring Street in Exeter. The South Australian Railways Commissioner had wanted a bridge to carry the tramway over the railway line but the Municipal Tramways Trust and the local residents were against the plan saying that the bridge would be unsightly and that it would cost the Trust 18,000 pounds. Another argument was that it was only a matter of time before the railway would be removed from Semaphore Road (although it wasn't until 1978 that the railway line was finally closed and removed in 1981). In May 1917, the new tramway service was commenced, initially with one tram crossing the railway crossing at the beginning of the day and running a shuttle service from the terminus at Largs. Passengers heading to and from Port Adelaide had to get off the tram at one side of the railway crossing and walk across to join another tram at the other side for the rest of the journey. This arrangement would only last a fortnight. The arrangement for making passengers change trams at the crossing became a major annoyance for the Municipal Tramways Trust. Without any prior consent from the Railway Commissioner, regular tramway services commenced over the level crossing. The relationship between the Railways and Tramways became glacial when two days after full tram services commenced, a railway track gang arrived with a trolley full of timber sleepers and red flags. The track gang threatened to dump the sleepers over the crossing and prevent tram services until some sort of arrangement was made. The following day, negotiations began and it was eventually agreed that full tram services could cross the rail line on the condition that the Municipal Tramways Trust build and operate a signal box to control traffic movements. Before the signal box was erected, a flagman was sent out to control tramway movements. After these initial problems had been overcome, the tramway to Largs had a fairly quiet existance with tram services through routed to Rosewater. Leaving 'Black Diamond' corner, the tram service ran down St Vincent Street, crossed the Jervois Bridge, Hart Street, Swan Street, Ring Street, Woolnough Road, Military Road and finally ran along Jetty Road before terminating opposite the Largs Pier Hotel at the intersection with The Esplanade. As well as tram services through to the terminus, a short working was operated from Port Adelaide to Hargrave Street in Peterhead although these services ceased sometime after 1925. Tramway services to Largs ceased in July 1935. 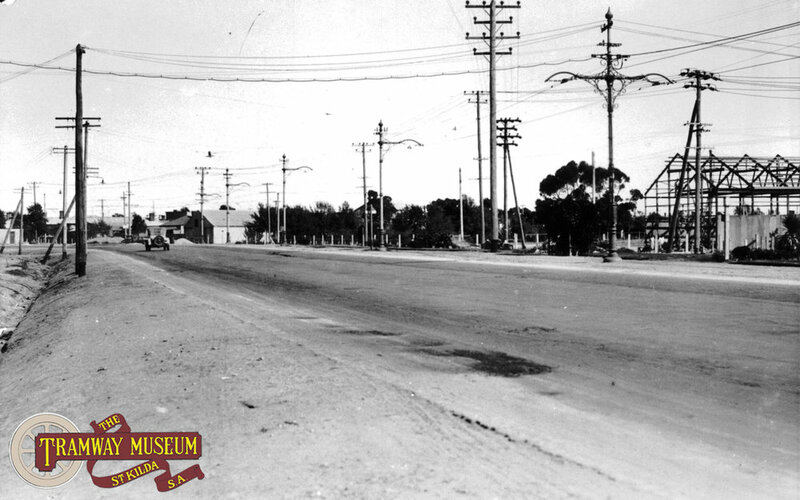 A railway had been running down the middle of Semaphore Road since 1878 but after 1917, the thoroughfare also contained the tracks of the local tramway system. A tram towards the right of the photo has just departed from the terminus in The Esplanade and is climbing up the short gradient at the end of Semaphore Road in the 1920s. Photo: Murray Billet Collection. An opening procession of trams had left the depot in Port Adelaide and ran to Semaphore as part of the official opening for the new Port Adelaide tram system in April 1917. Semaphore was (and still is) a popular seaside suburb and the trams served the local attractions in the area in competition with the railway service. In 1918, the Port Adelaide Council made a request to the Municipal Tramways Trust to erect a bandstand in the same manner as what had been previously erected at Kensington Gardens and Henley Beach on the main tramway system. In January 1919, it was announced that a band stand would be erected on the foreshore at Semaphore and this was ready for use in December that year. To transport the Tramways Band, B type 'Toast Rack' tram 40 was transferred to the Port Adelaide depot from the main system. Although the bandstand at Semaphore was intially successful and resulted in special tram services being run, the Tramways Band only performed as a means of increasing ticket revenue on the trams. It was realised that most people attending the Semaphore performances arrived by train which provided transport right through to the City. By 1921, performances had ceased in Semaphore. Leaving the 'Black Diamond' corner, trams to Semaphore travelled along St Vincent Street, crossed the Jervois Bridge, Hart Street, Military Road and Semaphore Road before turning left in to The Esplanade where the line terminated. Presumably, the line made the final turn in to The Esplanade so trams could terminate on a level track rather then on the short gradient at the beach end of Semaphore Road. As well as the regular Semaphore services, trams also ran a short working to Glanville, terminating at Connor Street until around 1925. Services to Semaphore ceased in July 1935. G type 'Birney' tram 303 is seen at the Semaphore terminus ready for a run to Rosewater. Photo: MTT. The line to Rosewater was opened along with the Albert Park and Semaphore lines in April 1917 and served the area to the South East of Port Adelaide. Unlike the other lines, traffic was so light that no additional 'short working' services were needed on the line which was single track for most of the line. The four G type 'Birney' trams which were imported from J.G.Brill & Co in the United States for use on the Port Adelaide tramways spent most of their operating life on the Rosewater line, working through to either Semaphore or Largs. After departing 'Black Diamond' corner, the line ran along Commercial Road before turning left in to Grand Junction Road and ran to a terminus opposite the railway level crossing in Rosewater near Jenkins Street. Like the Largs and Semaphore lines, tram services to Rosewater stopped in July 1935. The line to Albert Park ran on the eastern side of the generous expanse of the Port Road median strip and was single track after leaving the Commercial Road precinct. In this photo, the overhead poles show the point where the double track section ended in Port Road. The Port Adelaide depot is out of frame to the left. The line to Albert Park was the only portion of the Port Adelaide system to be converted from a pre-existing horse tram line. Originally opened by the Port Adelaide, Queenstown, Alberton and Portland Estate Tramway Company, the line ran from the 'Black Diamond' corner in Port Adelaide via Commercial Road and Port Road to Albert Park with the line terminating at the company's depot between Murray Street and Glyde Street. Unlike every other privately owned tramway in Adelaide which was built to standard gauge of 4' 8 1/2" (1435mm), this line was constructed to the broad gauge of 5' 3" (1600mm) which was the same as the railway network. Initially, operations were provided by a steam tram motor built by Merryweather in London and was named 'Eureka'. The steam tram towed one of two trailer cars built to a similar design as the horse trams running in the City. Services on the line commenced in May 1879. The poor condition of the local roads as well as occasional flooding meant that operations of the steam tram motor were problematic. The line was sold to William Cave and John Darling who sold the steam tram in 1882 which was later used on the Glenelg railway. From that date onwards, tramway operations continued using horse traction. Before electrification, the line was sold a second time. When the Municipal Tramways Trust was acquiring the various horse tramways in Adelaide, the line from Port Adelaide to Albert Park wasn't taken over. Port Adelaide residents who had been observing the development of the new electric tramway in the City between 1909 and 1911 started to agitate for the horse tramway to similarly be converted to electric traction. In 1912, the Municipal Tramways Trust was given the authority by the South Australian Government to purchase the line. The line to Albert Park was opened on the same day as the Semaphore and Rosewater lines in April 1917. Leaving 'Black Diamond' corner, the line ran along Commercial Road and then on the eastern side of the Port Road median strip to the terminus at High Street, Albert Park. Albert Park was the closest point that the isolated Port Adelaide tram system got to the City. Private bus operators used the systems' isolation from the rest of the tramway network to their advantage and in the early 1920s, bus competition was rife along the length of Port Road. To try and combat this the Municipal Tramways Trust commissioned its own bus service running from the City to the Port. By 1928, all of the private bus operators had been taken over. By 1930, services had been altered with the bus service running to connect with the Albert Park tram. Timetables were changed which provided a more frequent and faster service. The existing fleet of trams at Port Adelaide were considered a little bit slow however and ten of the faster C type trams (181 through to 190) were transferred to Port Adelaide to run this service. Despite the use of these additional trams, the isolation of the Port Adelaide tramways was still the main problem and in late 1934, direct bus services were introduced through to Port Adelaide once again. In November 1934, the last trams ran to Albert Park and the line was closed.